The Invalid Events check finds linear referenced events that do not have an associated route (orphaned events) or contain invalid measure values. The check also identifies gaps or overlaps between events within the same route or across multiple routes. Orphaned events—Events that do not have associated route features. Events with invalid measures—Events that contain measure values outside the range of those in related route features. This includes event measures that are greater than, less than, or within a gap in a related route's measure values. Overlapping events—Linear event features that overlap event features of the same category within the same route or across multiple routes. 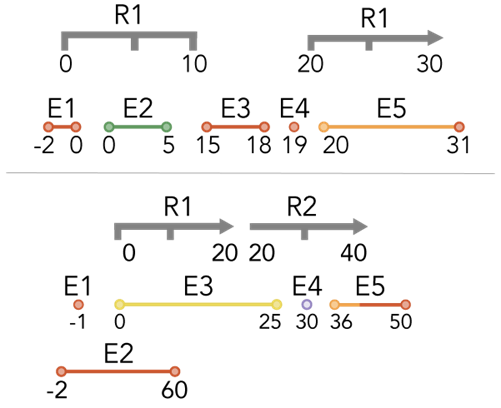 Events with gaps—Linear event features that represent gaps between other event features within the same route or across multiple routes. In roadway management, a speed limit event representing 55 mph needs to have the same measure value as the related route feature. In roadway management, event features that contain invalid measure values adversely affect length calculations (for example, United States Department of Transportation mileage reports). In pipeline management, recording of the protective coating applied to underground assets ensures accurate reporting on features that cannot be directly observed during inspections. To avoid pipeline corrosion, recording the measure of protective coating applied to underground assets ensures accuracy of reporting and safety of underground features. Invalid Events—The image below illustrates point and linear events (in red) that contain invalid measure values. 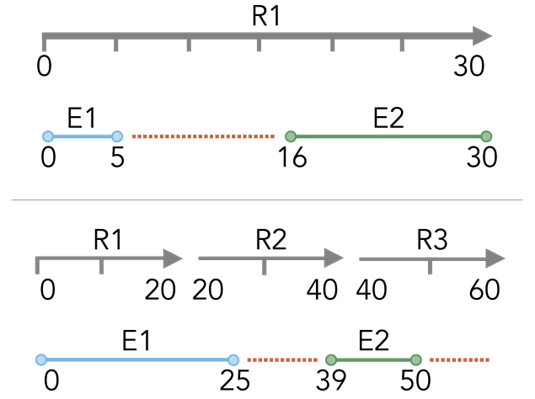 Overlaps—The image below illustrates linear events (in red) that overlap other events within the same route or across multiple routes. 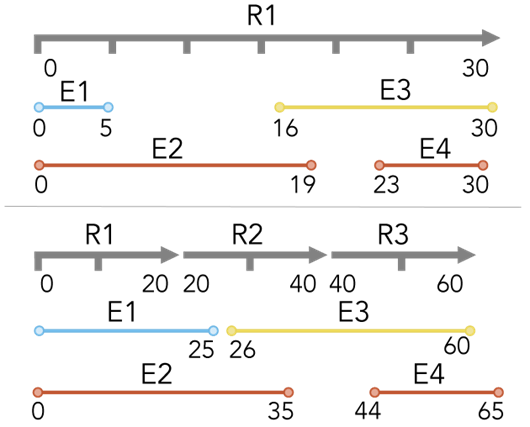 Gaps—The image below illustrates missing linear events (in red) that represent gaps between other events within the same route or across multiple routes. The input feature layers evaluated by the rule. Valid inputs for this rule type are point and polyline feature layers. Click the Forward button to apply filtering to specific features in the feature layer. The feature layer to which events are referenced. Valid inputs for this rule type are m-enabled polyline feature layers. Click the Forward button to apply filtering to specific features in the feature layer. The name of the field that contains values used to associate events to routes. The field must be a numeric data type. The name of the field that contains the starting measure value for a point or linear event feature. The name of the field that contains the ending measure value for a linear event feature. The name of the field that contains values used to associate routes to events. Error conditions evaluated by the rule. Find orphans—Orphan events are those features that do not have a corresponding route feature (as identified by the event's Route ID attribute value). Find invalid measures—Find events that contain measure values that are greater than, less than, or within a gap in a related linear feature's measure values. Find overlaps—Find linear events that overlap events of the same category within the same route or across multiple routes. Find gaps—Find linear events that represent gaps between other events within the same route or across multiple routes. Optional value used when finding events that have invalid measures or represent a gap or overlap on other events. A unique title or name for the rule. This information is used to support data quality requirement traceability, automated reporting, and corrective workflows. Descriptive text of the error condition when noncompliant features are found. This information is used to provide guidance to facilitate corrective workflows. Severity of the error created when noncompliant features are found. This value indicates the importance of the error relative to other errors. Values range from 1 to 5, with 1 being the highest priority and 5 being the lowest. Tag property of the rule. This information is used in rule authoring and management workflows to support traceability and reporting of data quality requirements. When configuring filter parameters, care should be taken when using database-specific SQL functions that differ from those supported in your production environment. For more information, see SQL reference for query expressions used in ArcGIS. Validation of point and line events is supported. A Route ID field (numeric data type) is required for all events. The event's related Route Source feature layer must be M-enabled. Optionally, you can define a Tolerance value that will be used when finding events that have invalid measures or represent a gap or overlap on other events. This value cannot be less than the M-tolerance value of the Input Route Layer. For more information, see The properties of a spatial reference. Events associated with nonmonotonic route features are not evaluated by this check. Nonmonotonic routes are those that contain measure values that are either continuous or not strictly increasing or decreasing in value. The Monotonicity check is used to find nonmonotonic routes that require correction. For more information, see Monotonicity. Events that do not have an associated route (orphaned events) are not evaluated by either the Find overlaps or Find gaps search criteria. Orphan events are those features that do not have a corresponding route feature (as identified by the event’s RouteID attribute value). Events that contain invalid measure values are not evaluated by either the Find overlaps or Find gaps search criteria. Invalid event values are those measure values that are greater than, less than, or within a gap in a related linear feature’s measure values. The Find invalid measures option finds events with invalid measure values and is automatically enabled with either the Find overlaps or Find gaps search criteria.